Cover albums are risky business. They occasionally have some great songs performed in a unique way. However most of the time, they are just aren't very good, plain and simple and the latest 'Punk Goes...' compilation is no different. In fact it's worse, it's a disaster. Take 14 of the most popular and up and coming bands in the alternative scene at the moment and get them to cover 14 of the most popular pop songs from the decade or so. Sounds like it could be pretty interesting and has potential. Unfortunately its not interesting at all. August Burns Red and Alesana scream and growl there way through their covers of Britney Spears and Justin Timberlake respectively. While Breathe Carolina show how punk they are with their dance beats and auto-tuned vocals with a cover of Miley Cyrus' 'See You Again' and the same goes for Attack Attack! 's cover of 'I Kissed A Girl' (Katy Perry). The highlights of this compilation are few and far between; A Day To Remember take on The Fray's 'Over My Head (Cable Car)' in their usual way, whilst Four Year Strong's 'Love Song' hit the nail on the head and just manage to make the song their own. The same goes for Chiodos' cover of Harvey Danger's 'Flagpole Sitta'. However this particular track is spoilt with awful screaming. The other listenable tracks that are worth mentioning are Bayside's cover of 'Beautiful Girls' and Mayday Parade's 'When I Grow Up', originally by the Pussycat Dolls. The problem with these highlights are that they are only JUST worth listening to. They are a like a rubbish piece of clothing you get from your mum as a Christmas present, you wear it a few times to please them but after awhile you forget about it and then ignore it. It is true the songs are covered in a unique way but they're terrible and for the most part, they are unlistenable. I can see they're fun to listen to and for the most part the songs are laughable but for the wrong reasons. If I was Fearless Records and I'd have a hard think about where to take this compilation series next. 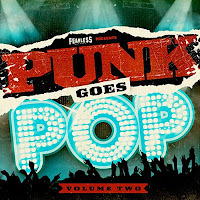 'Punk Goes Pop Volume 2' is available on Fearless Records on March 9th. Visit 'Punk Goes Pop Volume 2' MySpace for details.